I was in my favorite store the other day when I noticed these "pants" located next to the jeans and tops in the girls' dept. I was trying to figure out why there were pajamas in the regular clothing section. I asked my daughters what they thought of that and they responded "oh mom, those are actual pants that you wear just as if they were jeans or khakis". I was appalled! There is no way I could let my kids walk out the door looking like they just rolled out of bed. I then started to noticed more and more girls wearing them to school. Maybe I am older now and have lost some fashion sense, but I think it looks ridiculous! What do you think? Would you let your daughter wear them to school? I saw these at Kohl's and asked my daughter the same thing. I wanted a few pairs to wear around the house. I thought they were lounging pants! I had no idea kids were wearing them to school! No, I wouldn't let her wear these to school unless it was "wear your pajamas to school day" or something. 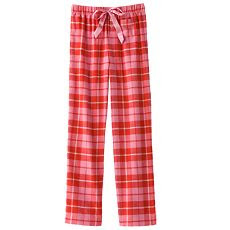 When I was in highschool it was ok to wear flannel PJ pants to school. They even sold them in the school colors. Typically people wore them on days where we started school late, went home early, or for school spirit days. The pants you're talking about, I still think they are lounge pants so I don't know why they tried to sneak them out of the PJ section, lol. As long as my child looks decent wearing them, puts on a pair of shorts underneath, they're ok with me. I'd wear them at home, but no way I would go out in public with those pants! I wouldn't let my kids go out looking like that either (if I had kids). I probably wouldn't worry about my daughter wanting to wear those to school, but I don't have kids, so maybe I won't know what this really feels like until I do. For now, I think I would only worry about my daughter exposing skin.